Brancott Estate Wines, the Pernod Ricard brand, has created what it claims to be the world's first train station micro-vineyard. 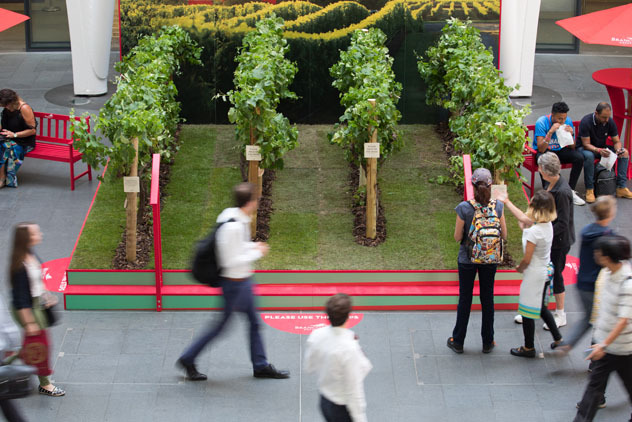 The activation at London train stations has 50 separate vines, standing at over seven feet-tall each. The brand explained that the idea behind the activation is to be the first to do something unexpected, much like being the first to plant Sauvignon Blanc in Marlborough, New Zealand, in 1973. Commuters can walk through the micro-vineyard and sample a 100ml glass of wine. There are also "selfie spots" throughout the experience to encourage visitors to share their experience. The activation ran at King’s Cross yesterday, and will also visit Waterloo Station on 19 July, London Bridge Station on 21 July and London Paddington on 24 August. It is being delivered by Cake, the brand experience agency part of the Havas Group. Maria Huete, wine ambassador for Pernod Ricard UK, said: "We’re really proud of the Brancott Estate Wines heritage and being the first to create Marlborough’s Sauvignon Blanc. We thrive on the unexpected and can’t wait for our micro-vineyards to surprise travelers on their way through the stations. Definitely not what you’d expect!"